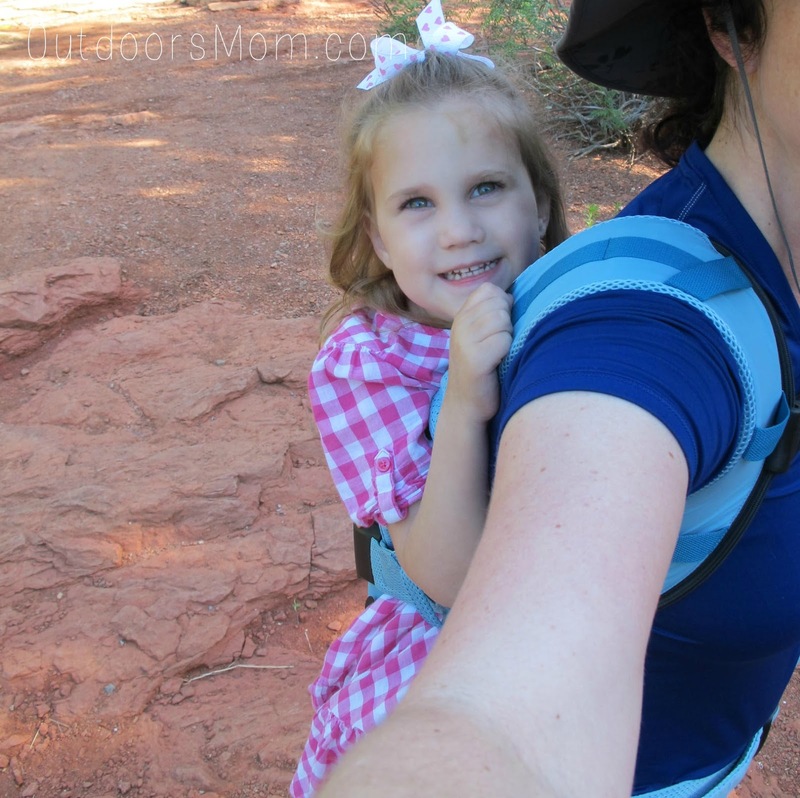 As an avid outdoor mom, one of my ESSENTIAL pieces of gear is a comfortable child carrier. My first was a fabric carrier that only allowed me to carry my child in the front. I liked the carrier but once my daughter got to be about 9 months old, carrying her weight in the front threw off my balance when we were hiking. So it was time to buy a different carrier. My next carrier was a framed carrier. We have loved this carrier and continue to use it. This is probably a common story among parents who crave outdoor adventure; always buying new gear as your child grows. But what if there was one carrier that would fit both a newborn and toddle and was comfortable for carrying both? 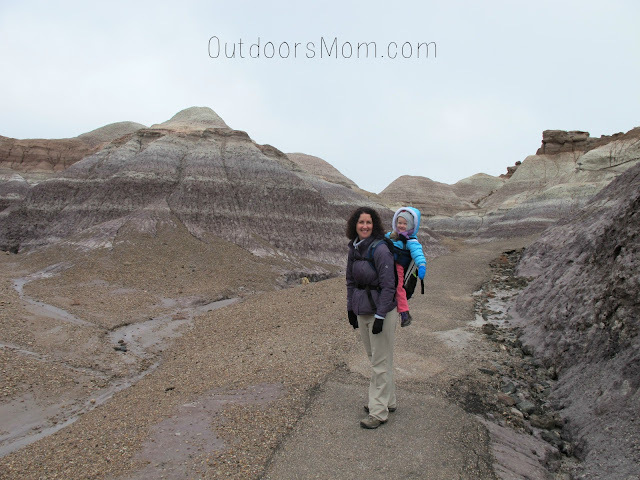 Baby Bjorn's newest carrier is the One Outdoors and they designed it for parents who love outdoor adventure. 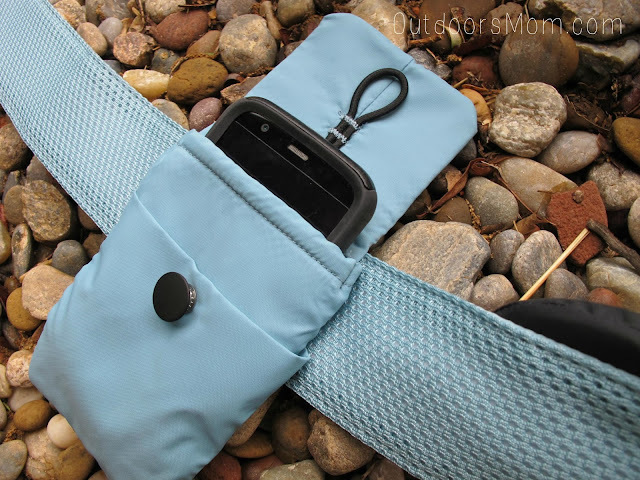 The added comfort of a hip belt makes it ideal for long outdoor excursions and, here is the best part in my opinion, this also allows the child to be carried in the front or back. So whether you have a newborn or toddler, this carrier is comfortable and practical. But don't let the name fool you, even if you aren't an avid outdoors mom or dad this an extremely versatile carrier. When our kids were small we used our carrier at the store, park, around the house and we even took it in place of our stroller on road trips to save room in the car. Imagine being able to bring a small carrier instead of a stroller to the zoo or fair? With the added support of the hip belt, it makes all of these activities more comfortable for longer periods of time. Kids To Parks Day is this Saturday, May 21st. Already, over 400,000 people have pledged to get outdoors this Saturday. 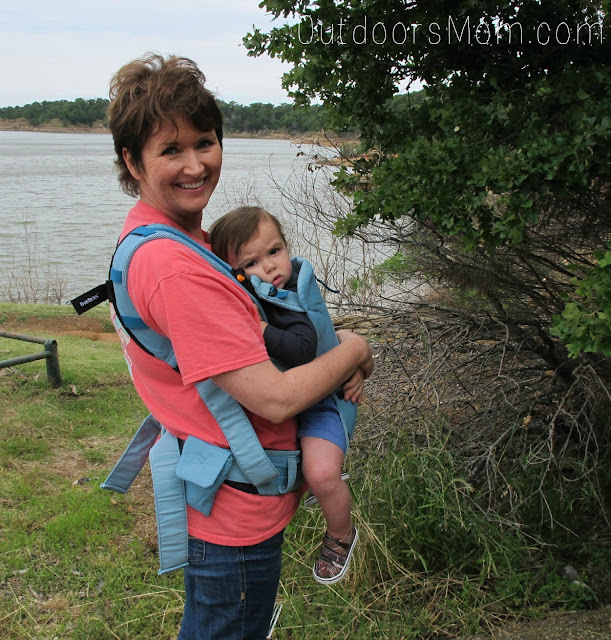 To encourage families to spend more time outdoors Baby Bjorn is giving away a One Outdoors carrier (these haven't even hit the shelves yet) to one lucky Outdoors Mom reader. Enter using Rafflecopter widget at the bottom of the post. Safety - Hip dysplasia is a deformation or misalignment of the hip joint. While this can be congenital, it can also be caused by over-restrictive baby carriers. 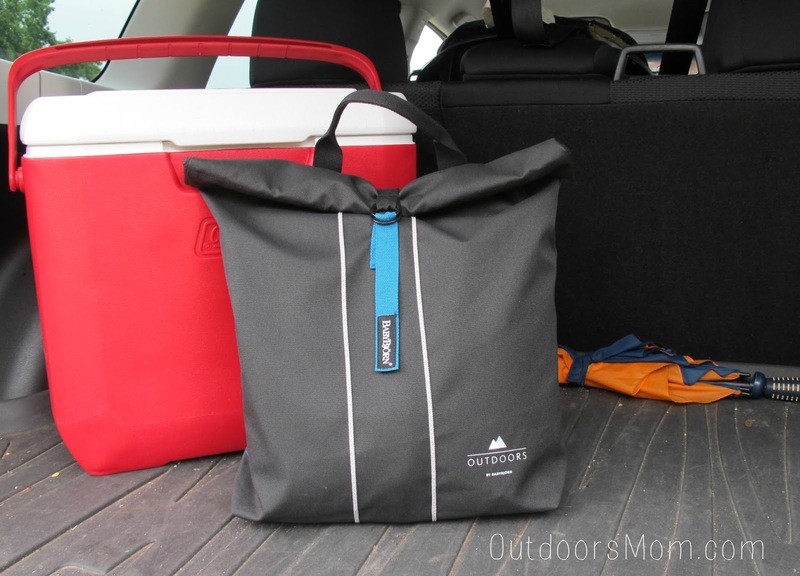 The One Outdoors carrier is designed to be hip safe. You can carrier your child facing toward or away from you and not worry about their safety. Ease of Use - One of my first concerns was how am I going to get a child onto my back with a soft carrier. I do it all the time with my framed carrier but it is really hard to do it by yourself without a frame on the carrier. But this carrier's design allows you to insert the child in the from position then, with the carrier on, rotate the carrier to the back carrying position. It take a little practice but it is simple once you get the hang of it. It was surprisingly easy even with a 3 year old. Comfort - I have always considered my framed carry comfortable. After long hikes my hips would be sore from the carrier but I loved hiking and it was the most comfortable option I could find at the time. Something I immediately noticed about the One Outdoors was that with the framed removed my hips could sway naturally and there wasn't a bar rest just above my hips (the bar is covered by the hip belt but it was still uncomfortable after a while). Another thing I immediately noticed and liked about the One Outdoors is that the kids sits right against my back. Duh, I know. But in my framed carrier my kids doesn't sit directly against my back. Which means when he/she moves I tend to sway with them. Think of the effect an out-of-control trailer has on a vehicle. When my kids were small this wasn't a big deal but as they have gotten bigger I have noticed that it throws me off balance at times. Might be hard to imagine if you haven't used a framed carrier but believe me when I say keeping my balance was much easier with the kid snug against my back. Size - The One Outdoors is larger than the original Baby Bjorn baby carrier; has to be, it has an extra strap. But it is much smaller than my framed carrier. It even comes with a handy carrying case which makes it soooo much easier to tote around or keep in the car. Lighter - The One Outdoors is much lighter than a framed carrier but not much heavier than a fabric carrier. They use light weight, water and dirt resistant fabric that dries quickly but is still durable. Storage - This carrier is much smaller than a framed carrier and the carrying case makes storing a breeze. This one of my biggest complaints about my framed carrier, it is large and awkward to store and transport. You only need One - This carrier has a built-in infant insert that will fit a newborn safely but unzips to hold a toddler. You will only need to buy ONE carrier. Not a newborn carrier, then a larger one as the child grows. The One Outdoors will take care of every stage between 0 and 3 years. 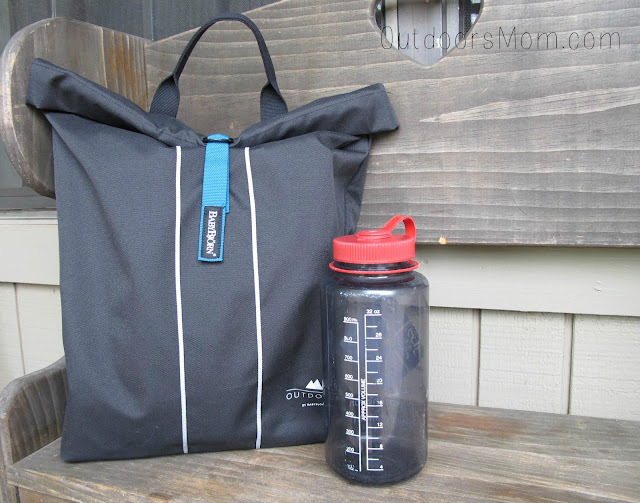 Carrying Capacity - There is not much storage in this carrier for extra items; you know, diapers, wipes, camera, etc. The do have a pocket for a cell phone, snack or keys; probably not all three at once. They also have loops sewn in to the shoulder straps meant to be used in conjunction with a carabiner clip to hang a water bottle. I am used to my framed carrier, which allows me to carry a lot. If you are headed on a long hike, you will most likely need to figure out a way to carry another bag or bring someone else to carry said bag. Lucky for me my son is old enough to carry a small, lightweight bag. Sun Protection: One feature that I immediately loved about my framed carrier was the built-in sun shade. 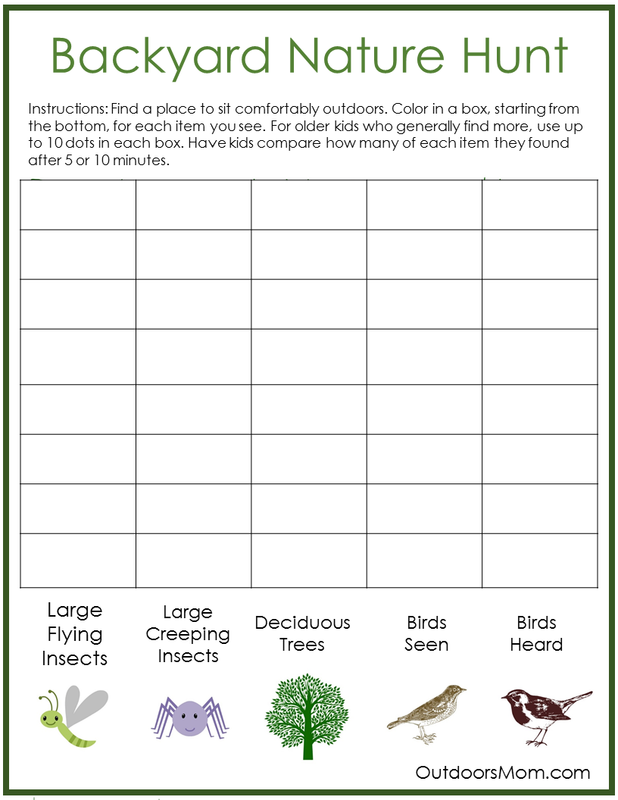 When I think of nature kits I think of "tools" that help kids see things in nature they wouldn't otherwise see; like binoculars and magnifying glasses or activities that encourage them to look closer. 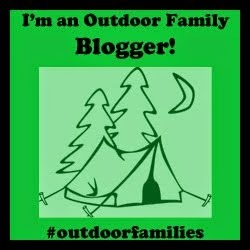 But I in addition to the exploring "tools", I like to include items that help my kids enjoy the outdoors and stay safe. 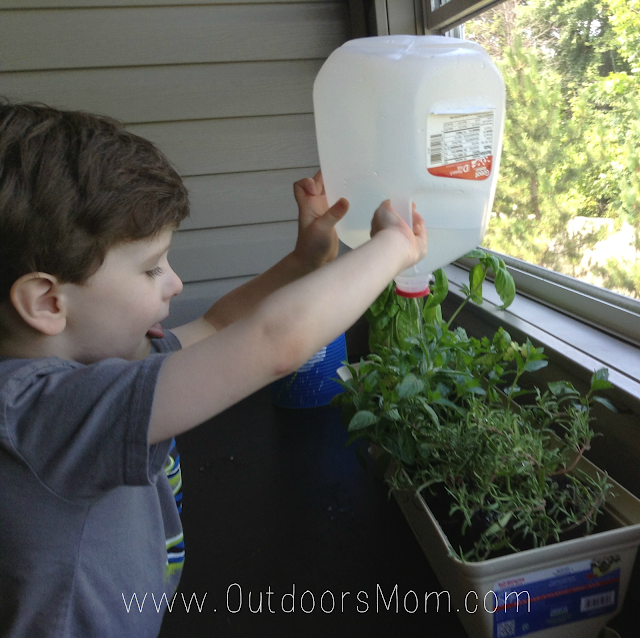 Because as much as I want my kids to learn about the nature, I want them to love their time outdoors. As with most things, my kids do better when they have a little variety; so I rotate items in our nature kit. Sometimes I even use our CamelPak for the backpack because the kids are more excited to carry it than a regular backpack. It may not carry as much but we tend to get farther and that counts for something. Books That Inspire Kids To Explore Nature! 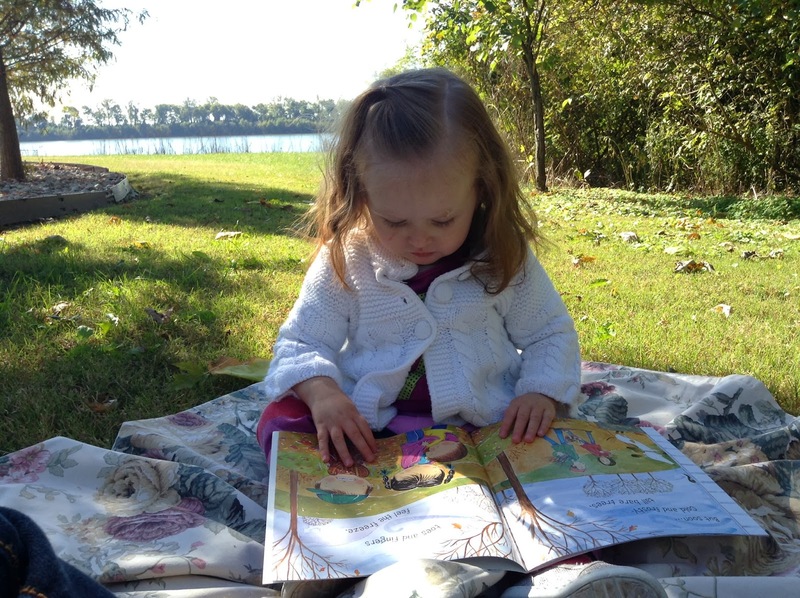 Did you know that one of the best ways to instill a love of nature in your kids is to spend time reading nature-related books and talking about what you read? It is true and it makes sense. While playing and exploring the outdoors does create a certain amount of connection with nature (and is an essential part of childhood), it is when kids start to understand what they are seeing that a true fascination and love forms. So besides watching nature-related media, reading is the best way for kids to gain knowledge about nature. Because of this somewhat new revelation I am always on the lookout for good nature-related books. So I was more than excited when I had the opportunity to interview author and photographer David FitzSimmons. He has written no less than six children's book about wildlife and is currently working another. David is also a Sigma Pro photographer who specializes in nature photography and freelance writer. Attracting Butterflies To Your Yard Without a Garden! I love butterflies. They are undoubtedly the most beautiful insects; graceful, colorful and unique. But beyond their beauty they are are essential to a healthy ecosystem. Did you know the pollinate as they fly from flower to flower? They do! Some of our favorite hikes and outdoor adventures have been when we have discovered butterflies. Kids love them and I can't think of many better ways to get the kids excited about getting outdoors this summer. Butterflies cannot fly when their body temperature is below 85 degrees F. This means they need to feed in the sun. Butterflies colors are more than just beautiful. They help them attract mates, absorb heat and provide some protection when flying among flowers. Puddling is when butterflies congregate around a puddle or patch of damp earth to gather essential minerals. The life spans of butterflies vary greatly between species. Some live only a couple days while others can live up to 11 months. Antenna are used to "smell". Butterflies migrate to avoid the cold weather. I realize not everyone has a "green thumb" or the desire to garden; but that doesn't mean you can't attract butterflies to your yard. 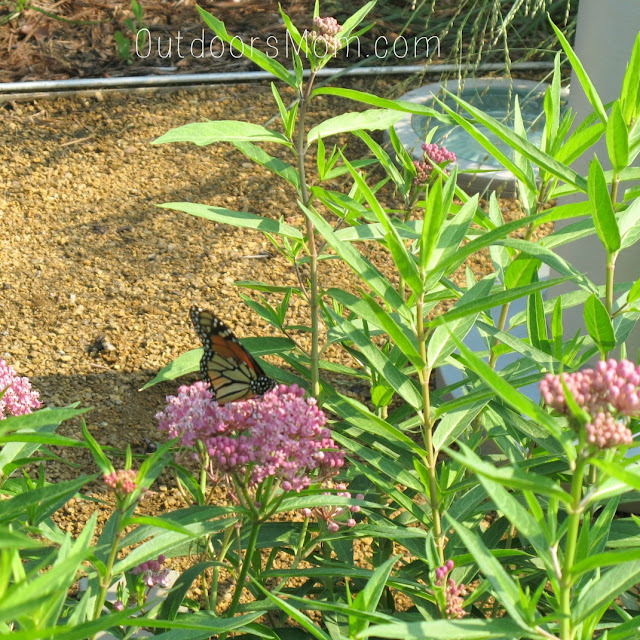 Here are a few ways to attract butterflies without having to garden. 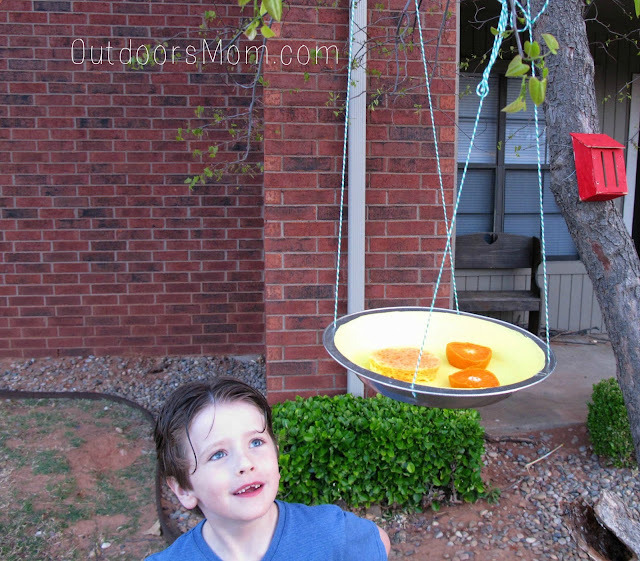 This feeder is very easy to make and there are plenty of ways to dress it up. I painted the bottom of the tin to a color that attracts butterflies. You can also add silk flowers to the rim of the tin or along the string. The disadvantage of this feeder is that it is light. If there is a lot of wind take it down. Punch four holes equidistant apart in the lip of the pie tin. Cut string into four equal lengths. These should be at least 18 inches long. Tie one string to each hole in the pie plate. 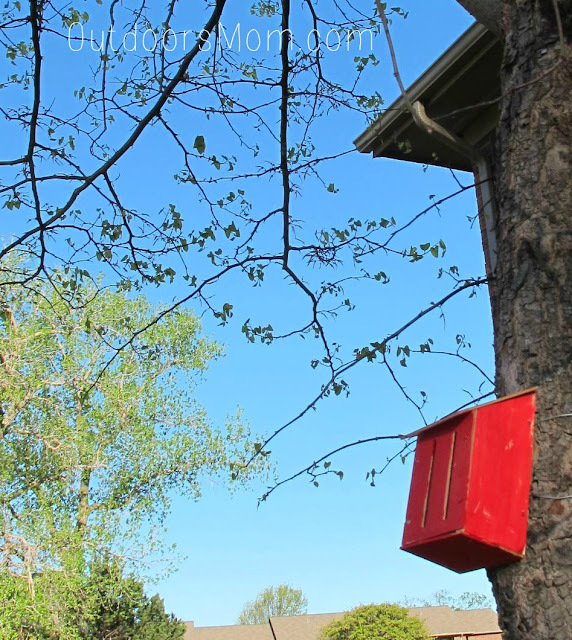 Hang feeder in a bright area. Preferable close to a window or door. Place sponge and over ripe fruit in the bottom of the plate. Fill sponge with sugar water. Did you know butterflies don't like the wind? It lowers their body temperature and makes it hard for them to fly. Providing a shelter for them is an excellent way to encourage them to stay in your yard. Plus it gives them a little protection from predators as well. We made this house at Home Depot during one of their Free kids workshops. It was a lot of fun, but if you can't find a workshop near you, you can buy one online. There are tons of options but this one Toysmith is fun because the kids can paint it. After you hang it place a few stick and leaves in the house to make it more appealing to the butterflies. As I mentioned earlier, butterflies obtain essential minerals from water. Having a place for them to find water will also keep them in your yard. It could be as simple as a bird bath or just a place where you dampen the earth regularly. You can actually buy kits online that will give you everything you need to raise the caterpillars to butterflies. I kind feel like this cheating because you aren't really attracting butterflies as much as you are bringing them to your yard. But once you have brought them, now you will have a few more ways to keep them around. Plus I just think this is a great way to get kids excited about nature. 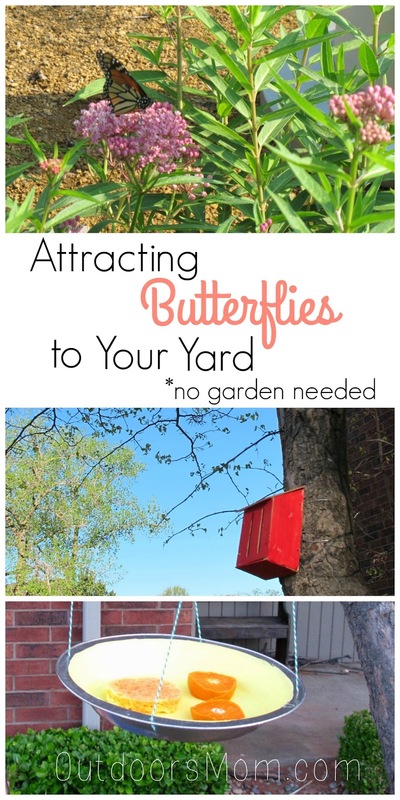 Your turn, how do you attract butterflies to your yard? "I don't have a yard." "I don't have a 'green thumb'." These seem to be my most common excuses for not gardening. But I have decided to stop making excuses and start getting my hands dirty. If I can, you can too and here are a few reasons why you should; time outdoors, fresh food, and connecting kids with food sources. The only type of gardening I can do right now is with flower pots, but you might be surprised how much you can do with them. I love them because I can use bagged soil; so no soil preparation needed. Pots can be purchased; so no need to build raised garden beds. And it is a great place to start if you are new to gardening. Flower pot gardening is a little different than traditional but still pretty straight forward. Unfortunately, when I start a project I don't always do a lot of research a head of time. As a result I have a lot of "learning opportunities" in my efforts to garden. So if you are ready to take the plunge, please learn from my mistakes. Here is what I have learned. The best plants to grow is flower pots are after the tips. 6 Creative Nature Journal Entries (free printables). I am pretty new to nature journals. I have spent countless hours outdoors and saved all of my school work from my undergraduate degree but I have never "journal-ed" about the outdoors. My son is in school so I haven't really wanted to add more "work" to his week but I thought it would be a fun activity for this summer. Not only will be be learning through exploring the outdoors and nature as a family but we will be preserving our memories and practicing hand writing skills and such. If you are new to nature journals, I have more resources that can answer your questions at the bottom of this post. 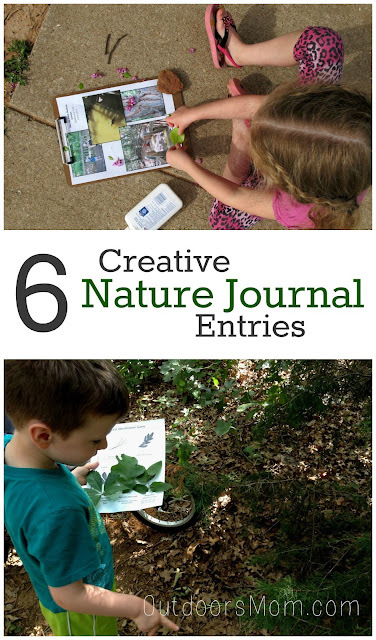 Here are a few ideas for entries for your nature journals. Tree ID for Preschoolers - This is an easy activity that introduces kids to the two basic types of trees and the different shapes of leaves. Maps - I found this article a while ago that talks about the benefits of teaching kids spatial skills. One great way to do this is to have kids draw maps. 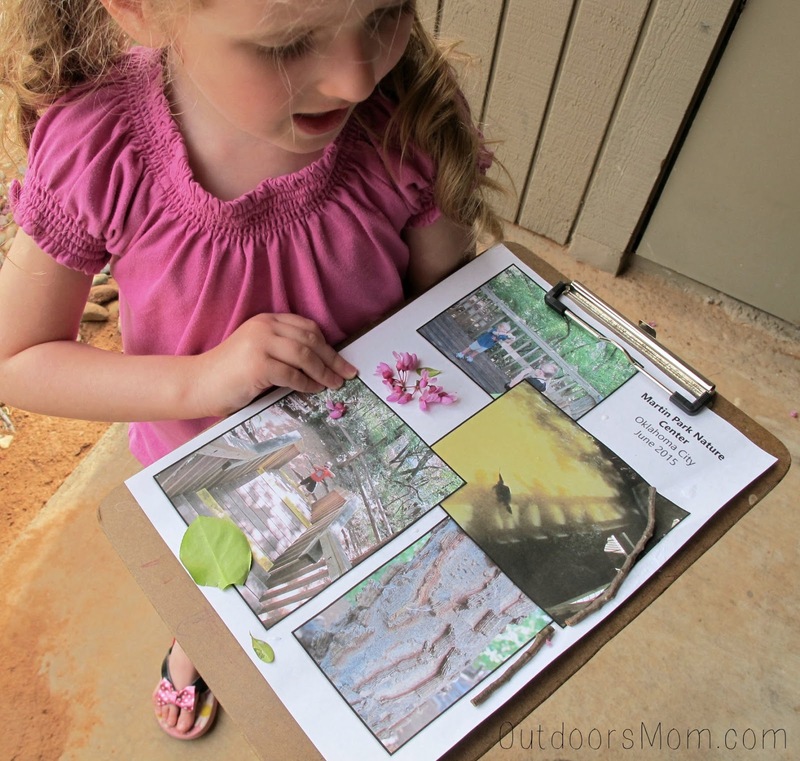 So on your next outing have your kids draw a map of the trail or park. Label landmarks, fun plants or where you saw animals. 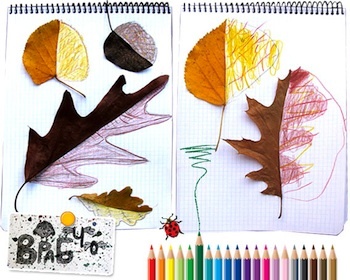 Green Acorns has a few other very creative map activities for your nature journals. Leaf Drawings - This activity can be done in the field or at home and is a another way to introduce your kids to more leaf shapes. Color Matching - My original idea was to just to draw circles of color and have the kids find natural materials that match each color. But one of my readers mentioned they do the same thing just using a rainbow. Brilliant! Just stick a piece of double sided tape over each color to stick materials to or print the pages on card-stock and cut SMALL slits so kids can stick flowers, leaves, etc. into the slit. See Tree ID Post for pictures of this process. Click on image to download a printable PDF version. Graphing - Have your child find a comfortable place to sit in your backyard for 5-10 minutes (depending on the age of the child) and color in the boxes according to the number of critters or things they see. 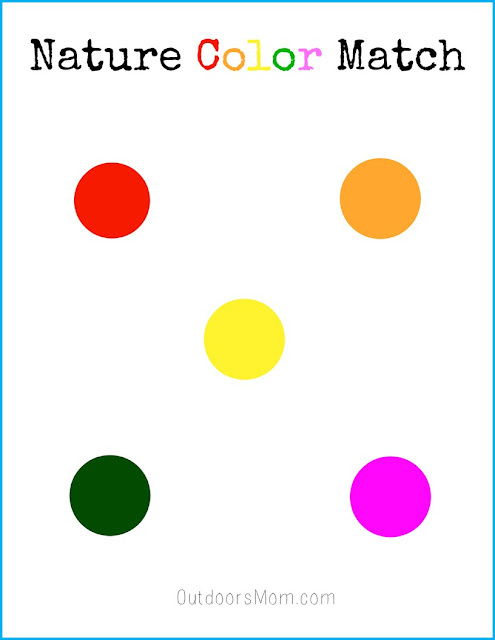 If the child is older you may want to have them place 10 dots in each box because they will mostly like see a lot more than younger kids and could run out of boxes. Then discuss your finding with your kids, compare and contrast the differences, etc. If you have questions about what you see, ask a naturalist as your local nature center. Click on image for printable PDF. Take pictures, decorate & journal - Let the kids have a camera and encourage them to take as many pictures as they want. Sort through and choose a few favorites to print at home. 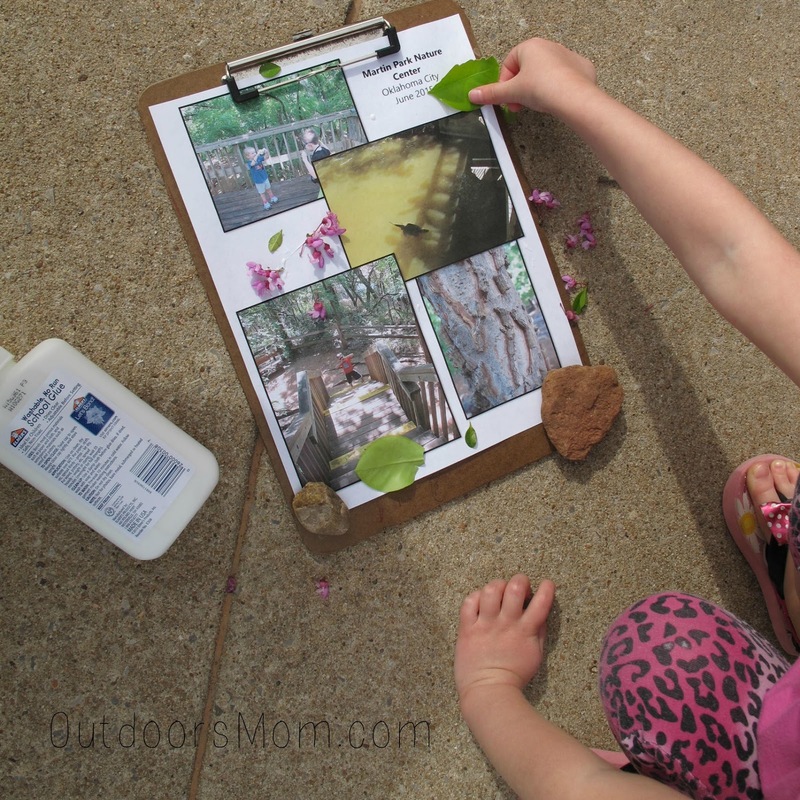 Make a collage and decorate with natural materials collected on the outing or let older kids write what they experienced. I generally add a picture of my child with the camera to the top. To save money and time I created the collage in Powerpoint and printed it out on regular paper. I did let me kids decorate it afterward. I then pressed it to preserve the flowers and leaves. 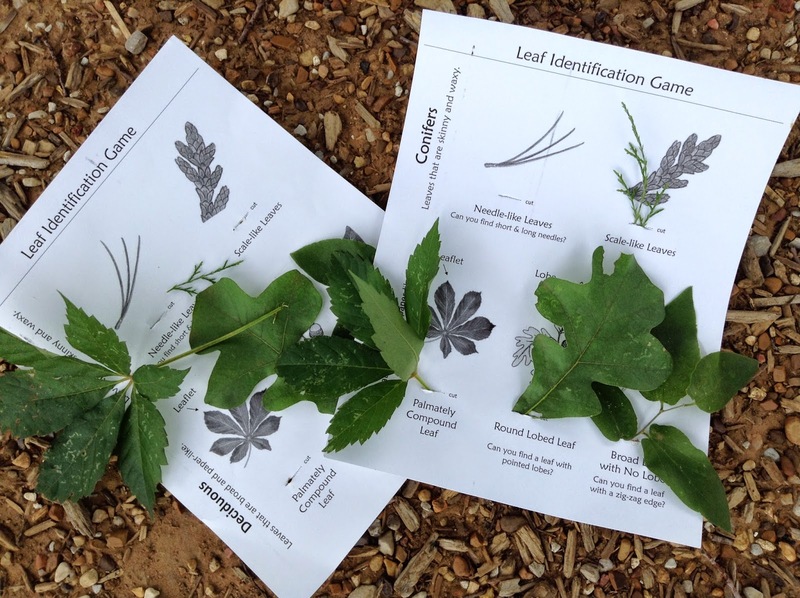 Rythums of Play has a great post that gives an introduction to the basics of nature journals. She covers a lot and offers a number of free resources. I prefer using a 3-ring binder for journals in general. That way I can add pages as needed, use plastic sheet protectors for delicate items and I don't have to take the entire journal on our adventures, just the page I need. 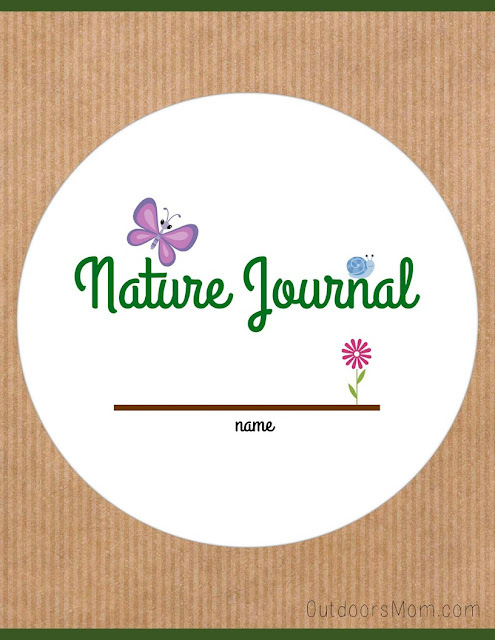 Here is a cover for a nature journal binder I created. Click on image to download a PDF version. Preserving the memories! Don't forget to press the pages with leaves and flowers. This can be as simple as placing pages between the pages of a magazine and piling heavy books on top. I generally leave them for a week or two. The leaves and flowers will last much longer if they are dried and pressed. DON'T FORGET TO ADD THE DATE. It would be a shame to forget when it happened. National Parks have been called America's best idea for good reason. They safeguard some of the most aw-inspiring ecosystems in the United States of America. 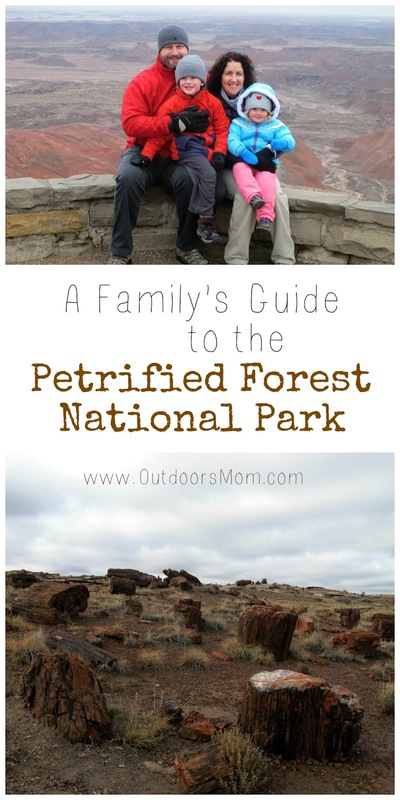 But our family outdoor adventures to these unique areas are only as good as our planning and there are a few things I wish I would have known before our visit to the Petrified Forest National Park. I did plenty of research ahead of time on the National Park Service website about activities and the amount of time we should expect to spend at the park and planned accordingly. The Park Service has laid out several Trip Itineraries on their website and going by those I assumed we would be able to see all of the major sites and have time to hike in the time I allotted. One problem, it took us longer to visit everything than what the website predicted. I guess should have known; everything goes WAY slower when you have kids. 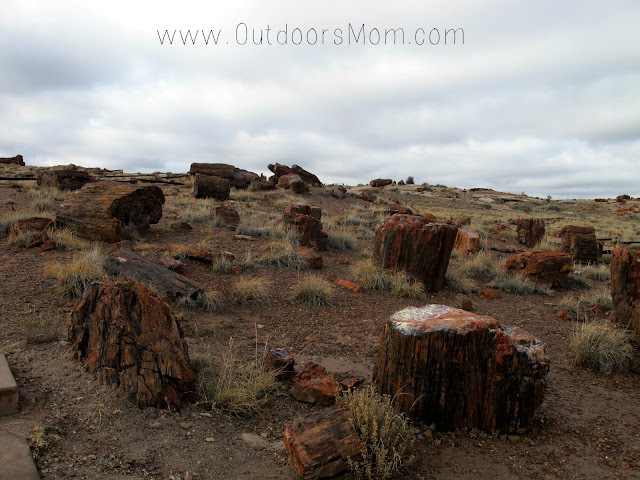 The Petrified Forest website suggested we could see most of the sites and have time to hike. Not true. We needed more time. Bring food. Some is available at the north and south entrances but it is pretty limited; especially in the winter. Closest towns are about 20 miles from the entrances. The biggest petrified logs are on the south end of the park. Leave time to visit and explore them. Here are a few more of the specifics of our visit and recommendations for making the most of your time. We stopped here to get a paper map, purchase souvenirs and obtain junior ranger program booklets. We did ask the ranger for advise on stops to make but we didn't take time to watch the movie. We had been in the car for a long time and it just didn't sound fun. 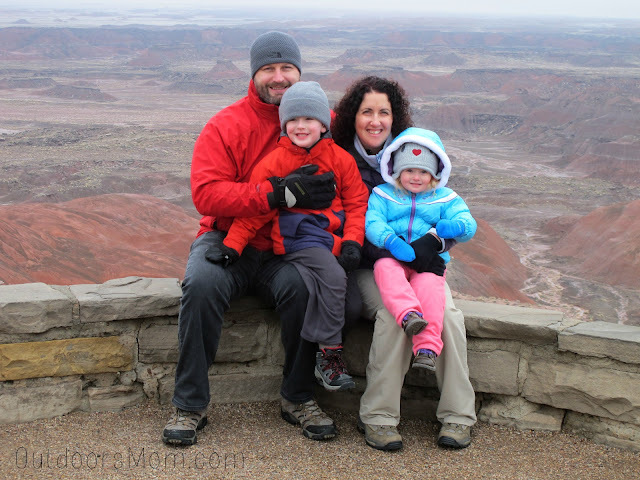 The Painted Dessert was stunning and we definitely do not regret taking time to stop at the Inn. If your time is limited don't stop at the viewpoints along the way, just head the to Inn. There are plenty of views there. My husband and I both love museums and wanted to spend more time at the Inn but once again it just wasn't the place for an energetic five year old who has been cooped up in the car for over a day. Our main purpose for stopping was to fulfill a requirement for the junior ranger program. Part of the original Inn before it was restored and converted into a museum. 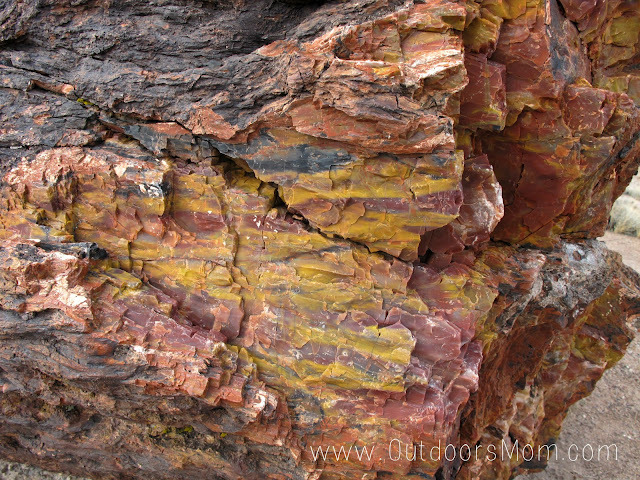 When we first left the Painted Desert and started seeing petrified logs we were amazed. We stopped a number of times and enjoyed the views. But I highly recommend NOT stopping to view the logs at this point. 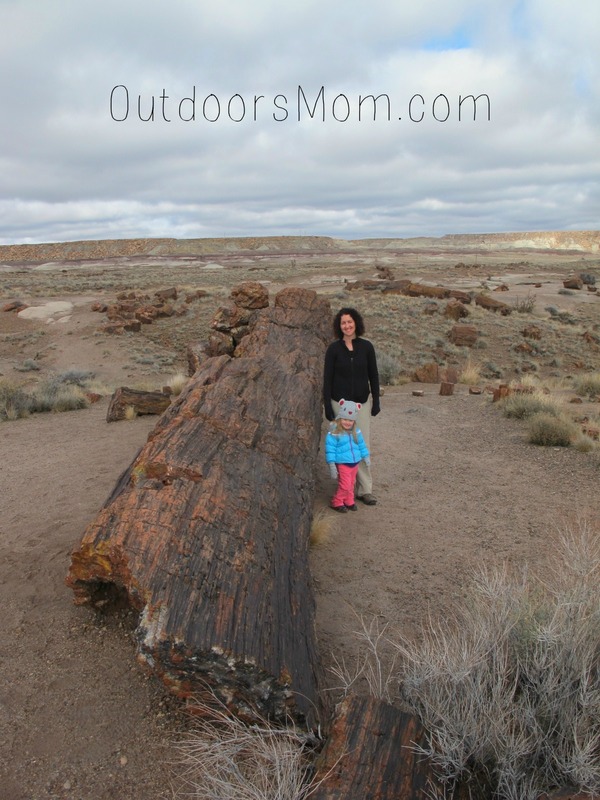 The Giant Logs at the south end of the park are much more impressive. I wish we would have spent the time down there. 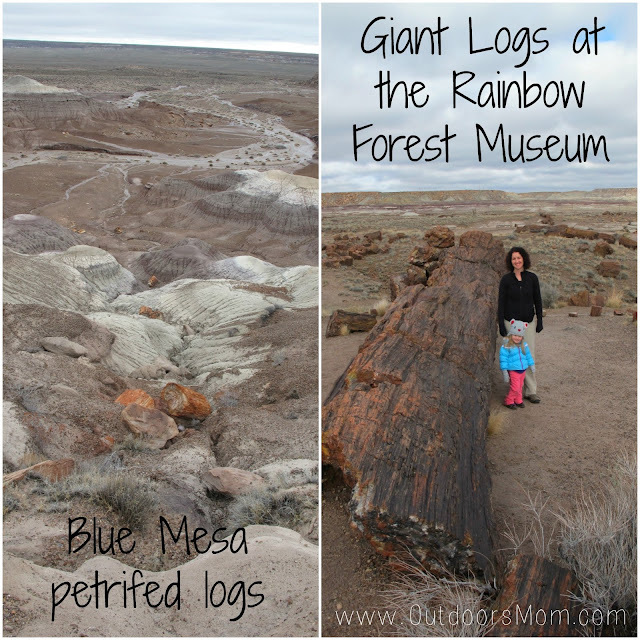 Don't stop to view the logs at the Blue Mesa. Be patient; they are much more impressive on the south side of the park. View from one of the viewpoints at the Blue Mesas. This trail is paved and perfect for the whole family. As I mentioned earlier, we had driven a long way and enjoyed stretching our legs. 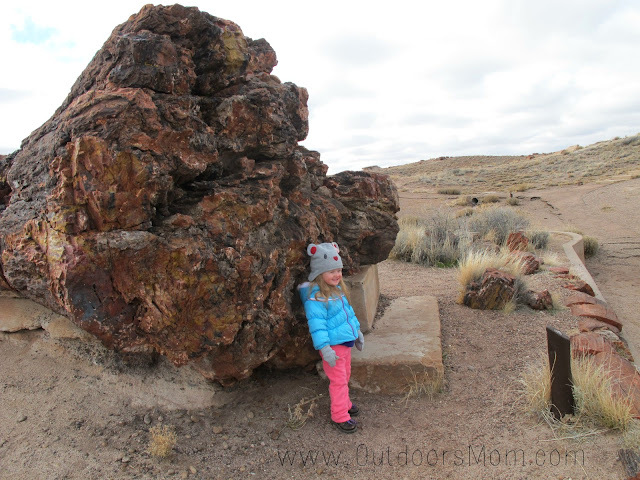 Although there were trade offs; there were other parts of the park we didn't get to visit. 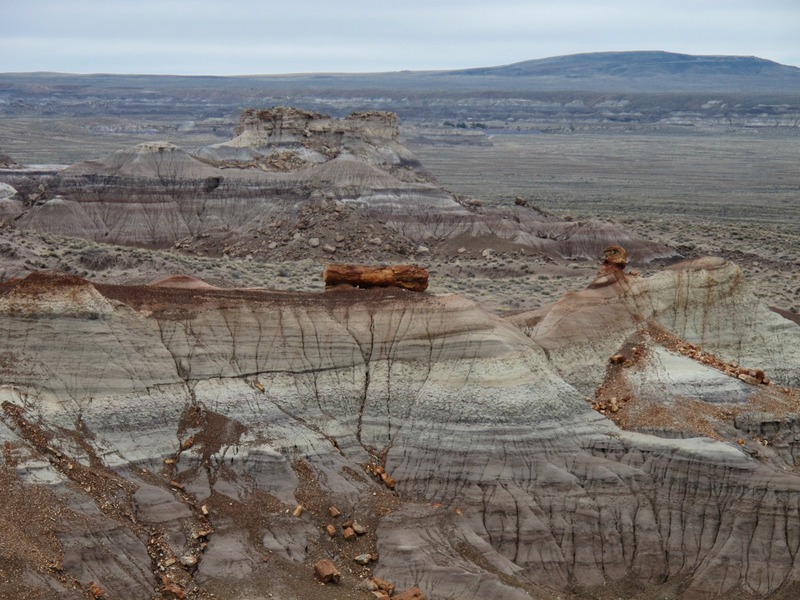 Driving through the blue mesas and stopping at the view points gives you a pretty good idea of the unique scenery and hiking is just more of the same. Fun & easy trail but if your time is limited I suggest skipping it to see other sites you won't want to miss. Yep, we skipped a lot in the middle because we ran out of time :(. My #1 recommendation is to plan for more time. We stopped here so the kids could be sworn in as junior rangers and to see the Giant Logs. There is also a gift shop and small cafeteria. But I highly recommend bringing food with you. In the winter they had some packaged sandwiches and other prepackaged food, but it wasn't much. In the summer they have a few options for hot foods. Amazing colors in the petrified wood. We visited in the winter just before Christmas. It was chilly but nothing unbearable. We layered up and were very comfortable. The #1 benefit of visiting this time of year was that there were no crowds. Still people around but I never felt crowded; which is saying a lot for a National Park. By the early afternoon it was warm enough to shed some of my layers. REMOTE. This National Park does allow back country camping but doesn't maintain any campgrounds. There are campgrounds in the area but they are anywhere from 45 minutes to 3 hours away. You can find a list of campgrounds on their camping page. There are plenty of hotel options in surrounding communities. We stayed in a Hampton Inn on the west side of Gallup, NM. We found most of the surrounding communities to be tourist traps and weren't too impressed with food options. I guess we are kind of picky. Overall we had a wonderful time and would love to go back and see the rest someday. Have you visited the Petrified Forest National Park? What were your favorite sites? 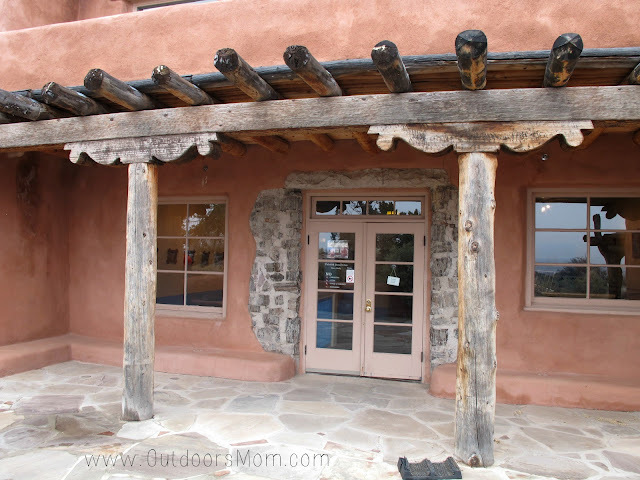 Here are a few posts I have written related to visiting national parks. Keeping the Kiddos Happy - Ideas for entertaining the kids without electronics.